The sternum, which is commonly referred to as the breastbone, is a long, flat bone in the center of the chest. The sternum is connected to the rib bones by cartilage. Its primary function is to provide protection for your lungs, heart and major blood vessels. If you're experiencing pain in this area while running, a number of possibilities may account for your discomfort, including conditions related to your heart. Chest pain caused by gastrointestinal problems is common among athletes. 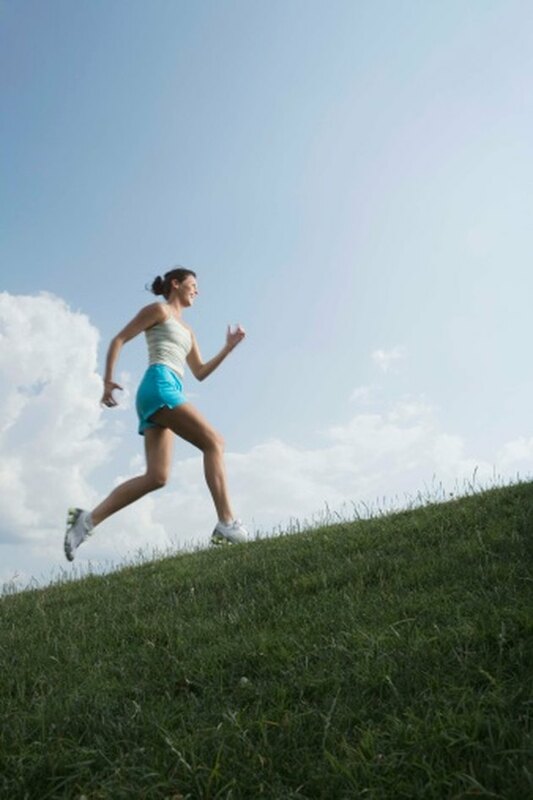 According to Rice University, running causes more GI symptoms than swimming and biking. Further, up to 50 percent of marathon runners and triathletes experience some type of GI disorder. Gastroesophageal reflux disease, or GERD, and digestive disorders make up roughly 30 percent of noncardiac chest pain in high performance athletes, according to "Sports Cardiology Essentials," edited by Christine E. Lawless. Gas, esophagitis, acid reflux and heartburn can cause bloating and lead to pain around the breastbone. Symptoms include sternum pain, nausea, diarrhea and cramping. Prolong exercise, dehydration, sports drink use and protein supplementation, all of which are common in runners, have been linked to GI symptoms. Costochondritis is a condition caused by inflammation of the cartilage in the sternum. While this condition is harmless, the symptoms, which include sharp chest pain, tenderness, discomfort when breathing heavy or difficulty breathing, are similar to a heart attack and other heart conditions. When costochondritis is accompanied by swelling, it's known as Tietze syndrome. There is no known cause for this chest wall pain but according to the Mayo Clinic, a traumatic injury, upper respiratory illness, an infection or chronic pain disorder may be linked to the condition. About 2 percent of outpatient doctor visits each year are attributable to chest pain. Often, the cause is noncardiac related. To be on the safe side, however, your doctor will be obligated to do a thorough examination so that she does not overlook a serious condition like acute coronary syndrome, pneumonia or a blood clot. According to American Family Physician, most patients with chest pain should have a chest X-ray and an electrocardiogram. Fever and a crackling sound in your lungs could be indicative of pneumonia. If your pain is accompanied by shortness of breath, you may be having a cardiac event. If your discomfort is easily exacerbated by palpitating your breastbone, the cause is most likely a musculoskeletal problem rather than a blood vessel restriction. Since chest pain has also been linked to panic disorders, your doctor may ask you a series of questions that are part of a mental health evaluation. Most noncardiac chest pain related to a musculoskeletal problem can be treated with ice, rest and nonsteroidal anti-inflammatory medication, such as ibuprofen and naproxen. Tricyclic antidepressants and muscle relaxants have been used successfully in treating costochondritis. While you may have to decrease the intensity of your runs, as long as the pain is tolerable, you should be able to continue performing. Runners with cardiac causes of chest pain should seek medical attention as soon as possible. The Mayo Clinic reports that it can be extraordinarily difficult to tell the difference between heart burn, chest pain and an authentic heart attack. Symptoms of a serious heart event are sudden pressure or tightening pain in the center of your chest that lasts more than a few minutes, pain that spreads to your back, neck jaw, arms or shoulders, discomfort in your chest along with shortness of breath; and pressure in your chest during physical activity.